A division bench of Jammu and Kashmir High Court today stayed a single bench order directing the state government to hoist the state flag on official buildings and vehicles of constitutional authorities. A petition was moved by National Secretary of BJP Farooq Khan before a division bench of Justices Tashi Rabstan and Bansi Lal Bhat challenging the single bench order passed by Justice Hasnain Masoodi upholding a government circular which asked all constitutional authorities to hoist the state flag atop their official buildings and vehicles. After hearing arguments, the division bench stayed the order of the single bench. "After hearing the argument for a long time, the Division bench finally stayed the judgement of single bench," Sunil Sethi, counsel for the petitioner, told reporters. A detailed order was awaited. 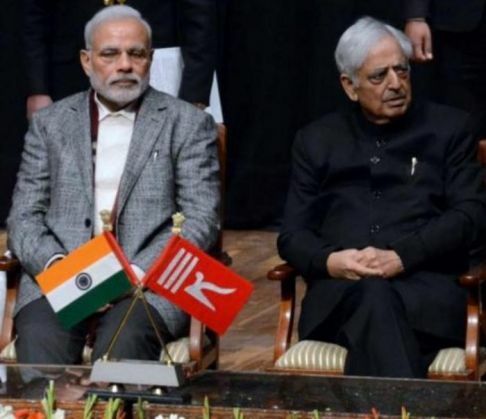 The development triggered a political storm with former Chief Minister Omar Abdullah attacking Chief Minister Mufti Mohammed Sayeed saying if he cannot defend the state's dignity and flag from the "nefarious" plans of his ally BJP "he should step down and find someone who can" defend it. BJP, which is an ally of the PDP, has had a stand of 'ek vidhan, ek nishan, ek pradhan' (One Constitution, One Flag, One leader).